All the waters of the coast away from reefs and bays and inlets can be classified as open water. These areas are affected by strong winds, powerful tidal currents and large waves. Open waters contain organisms that either actively swim or are carried by water currents, as well as rich communities of animals and seaweeds that occur on the bottom of Bass Strait. In addition, open waters are used by birds including a number of important migratory species. Many of these species may use the coast for breeding, but spend long periods of time out in open waters. Many marine mammals also inhabit our open waters including Australian Fur Seals, Bottlenose Dolphins, and Southern Right Whales. This group of organisms are mostly microscopic in size and drift through the sea, moving where the currents take them. Phytoplankton are tiny plants that make food from sunlight and are the starting point of many marine food chains. Zooplankton are animals, several of which are larvae of other marine animals such as crabs, seastars and fish. Pilchards are one of the most important commercially caught fish worldwide and are also known as sardines. Juveniles are found in estuaries and adults migrate along the south coast to congregate in bays. Pilchards are also an important food source for larger fish, dolphins, sharks and birds such as penguins and gannets. This jelly is an oceanic species that can grow to more than 1m across and its tentacles can reach 10m in length. It has a flat mushroom shaped body with lots of fine, long tentacles. Each tentacle has thousands of stinging cells that can kill their prey. Small fish sometimes shelter under the body of this jelly for protection. Seals are common along the Bass Strait Coast, often seen resting on beaches or rocky shores. They are excellent swimmers and can dive to depths of more than 100m to find fish, squid, cuttles and octopus. In the 19th century, the seal population in Australia was almost driven to extinction by hunters, but is now well on the way to recovery. Being the "right" whale to kill for their blubber, Southern Right Whales were nearly wiped out by whalers in the 1800's. Their large curved mouth contains many baleen plates to filter plankton from the water. These whales migrate from their summer feeding grounds near Antarctica to their winter calving grounds on southern continents, including the coast of Victoria. These spectacular diving birds fold back their wings and dive to catch fish. They are often seen offshore searching for prey. Their breeding colonies are tightly packed with nests made of seaweed and guano (bird poo). The fluffy white chicks hatch in early spring. Bottlenose dolphins are small, toothed whales that hunt prey such as fish and squid by emitting high frequency clicking sounds that bounce back off objects. The bottlenose dolphin is found worldwide in both tropical and temperate waters. Dolphins live in social groups and, like all mammals, feed their young on milk. These fast swimming predators use two long tentacles for capturing fish before shredding them with a rasp like tongue. Calamari use ink to confuse predators such as fish, dolphins and seals. Female calamari die soon after laying big clumps of jellylike eggs in Spring. Plankton are the millions of plants and animals that drift around our oceans. Although most of us may have never seen plankton they are an extremely important part of the marine and coastal environment because of their role in food chains and oxygen production. The word plankton comes from the Greek word planktos which means 'wandering' or 'drifting'. All plankton move with tides and currents, drifting where the water takes them. Phytoplankton make food by converting energy from the sun, a process called photosynthesis. Most food chains in the sea start with phytoplankton. Unlike seaweeds that need to attach to something solid, the phytoplankton drift in the sunlit surface waters. They are extremely common in places where there are plenty of nutrients and lots of sunlight, such as around the Antarctic continent in summer. In addition to making food, phytoplankton also make oxygen as a by-product of photosynthesis. Phytoplankton produce about half of the world's oxygen. Zooplankton are animals. Like the phytoplankton they drift in the water and some are capable of moving large distances up and down in the water to avoid predators and to graze on phytoplankton. 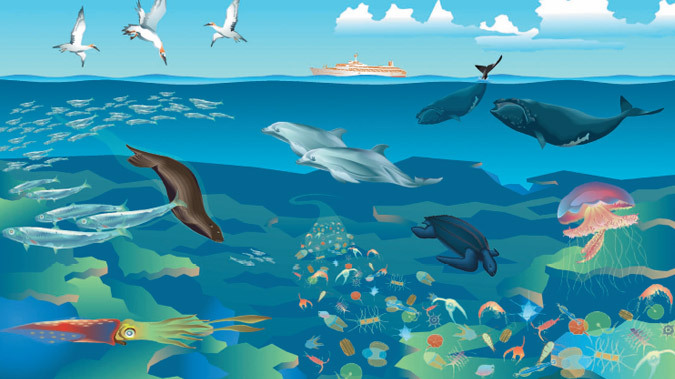 Their diets vary between species but they can eat phytoplankton, other zooplankton, or the products of living things. Zooplankton can be numerous in marine and coastal environments and are an important food for many animals from filter feeding sponges and bivalves, through to the largest of animals, the Blue Whale. Meroplankton only spend part of their lives drifting. These are the larvae of many types of marine animals including crabs, seastars, worms, sea urchins and fish. The larvae often look very different to their adult form. Holoplankton spend their whole life drifting as a part of the plankton community. A number of crustaceans, such as copepods and krill, spend their entire life as a part of a zooplankton community.